Home / Uncategorized / How many Billion dollar weather/climate disasters occur in the U.S. each year? How many Billion dollar weather/climate disasters occur in the U.S. each year? 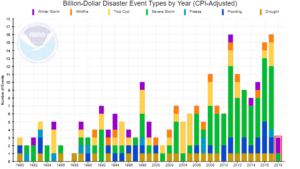 NOAA has your answer on their Billion-Dollar Weather and Climate Disasters: Time Series page. The page includes an interactive version of the graph here that allows you to select disaster types and adjust for CPI. The data is available to download. In May 2012, NOAA’s National Centers for Environmental Information — then known as National Climatic Data Center (NCDC) — hosted a workshop including academic, federal, and private sector experts to discuss best practices in evaluating disaster costs. A research article “U.S. 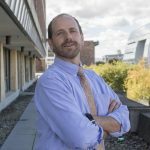 Billion-dollar Weather and Climate Disasters: Data Sources, Trends, Accuracy and Biases” (Smith and Katz, 2013) regarding the loss data we use, our methods and any potential bias was published in 2013. This research article found the net effect of all biases appears to be an underestimation of average loss. In particular, it is shown that the factor approach can result in an underestimation of average loss of roughly 10–15%. This bias was corrected during a reanalysis of the loss data to reflect new loss totals. Relative sea level in and around Boston has risen about half a foot in the last 50 years. So, all else being equal, the same storm 50 years ago would have six inches less water to push inland. That’s a big, big difference, and one that has developed on the climate scale. That’s how climate comes in, even in these weather events. Many times, in the discussion of weather and climate, we mistakenly consider these two words, and the concepts they define, to be mutually exclusive frames. Next Where does the U.S. rank on the world press freedom index?